Naomi Torre, Certified Etiquette Consultant, is a leading authority in the etiquette and protocol industry, and the founder and director of The Etiquette School of Monarch Beach, located in Dana Point, southern California. Naomi is a graduate of the prestigious Protocol School of Washington in the nation’s Capitol, and holds their highest certification as a corporate etiquette and international protocol consultant. 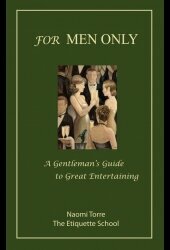 She is the author of A Gentleman’s Guide to Great Entertaining, which has been translated into Spanish and Russian. Naomi earned a B.A. degree in Liberal Arts, an M.A. degree in Management, and holds a California State upper-division teaching credential. As a “consultant to the Stars,” Naomi has appeared on BRAVO’s Millionaire Matchmaker, Real Housewives of Orange County, and has mentored Boyz II Men and the cast of CBS’s Family Affair. She has appeared on TBS’s Weekend Extra, KDOC-TV Daybreak, KTLA-TV The Morning Show, NBC’s Morning Show, ABC’s Evening News, Fox 6 News Live, KABC’s Eye on LA, and the British Broadcasting Company’s Television 2, among many others. Naomi’s broadcasts have included ABC’s Live in America, CJAD (Canada), the British Broadcasting Company’s Radio 5, and London Broadcasting Company. Naomi has been interviewed and featured in national and international newspapers and magazines including: M/I/S/C, Forbes, Cosmopolitan, Men’s Health, Women’s Day, The Wall Street Journal, Los Angeles Times, San José Mercury News, and Orange County Register, and numerous trade and business publications. Since 1997 Naomi presents programs assisting corporations, business professionals, and entrepreneurs to excel in business and social settings with polish and self-confidence, and to outclass the competition. The Etiquette School prides itself on offering custom-designed private briefings that meet the individual needs of participants. Naomi is committed to assisting individuals enhance their professional image and refine their interpersonal communication style. She assures a customized corporate program by working closely with your meeting coordinator. You will be given a comprehensive needs assessment which she reviews with the liaison. She then designs a seminar in accordance with your company’s or your individual expectations. Created specifically for children ages 9-11 and 12-17, Naomi offers age-appropriate dining and social programs designed to foster confidence, leadership and presentation skills. Along with learning core values needed to make a lasting good first impression, respect and self-esteem are key goals of the classes.